Greetings and salutations to all you cats and kittens out there from your Administrator of Excellence, Edgar Excellence! This Saturday, we return to our home at the Forrest Lodge VFW in Sellersville, PA for the first time this year, as we at Excellence Professional Wrestling (EPW) proudly present “Kittens Mittens”! Tickets are $20 for front row, $15 for general admission, and as always, kids 12 and under are admitted free with a paying adult! Bell time is at 7 pm, doors open at 6:30 pm, and with eight huge matches, you will want to get there early and get the best seats possible! The young team of Danger Jameson and Rembrandt Lewis will wrestle Smiley and Nick, accompanied by Ariela Nyx! Nick and Smiley teamed up back in the Summer of 2014, but Danger and Lewis have more recent experience. Nick and Smiley have Nyx in their corner, and who knows how she will get involved. On Saturday, we’ll see which team will come out on top! Karen Q will make her Excellence debut at “Kittens Mittens” to take on “Lady Excellence” Deonna Purrazzo! Purrazzo has been traveling the country taking on the best female wrestlers, so Karen has a huge challenge in front of her. But if she can beat Purrazzo in her debut, she might be able to call herself “Lady Excellence”! A newly angered and talkative Blind Rage will take on Icarus! 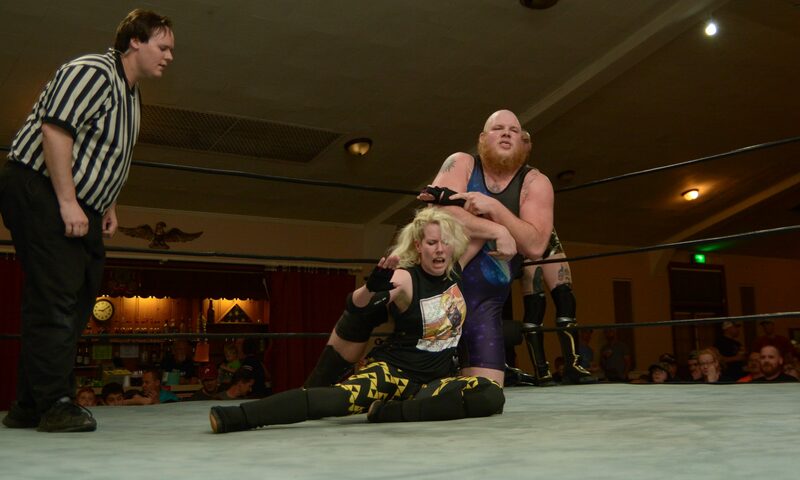 After the match between Hallowicked and Icarus, Rage attacked the Winged Ring Warrior as Wicked stood triumphant. Icarus wants revenge, while Rage wants someone to take his frustration out on. When these two men and former partners collide, who will be left standing? Too Many Cooks (Assistant Chef Blackmon and Sloppy Joe) will take on Ca$hflow Ken Broadway and a mystery partner. Too Many Cooks are as successful as they are popular and are undefeated as a team. Broadway is a young, talented wrestler, but crafty like a veteran. Who knows who he’ll choose for his partner? Too Many Cooks might suffer their first loss if they don’t take Broadway and his tag team partner seriously. In his debut at “20% Gratuity”, Havoc put in an amazing performance by winning the “Turkey Tumbler” match! He’s looking to impress the Excellence fans once again at “Kittens Mittens” when he wrestles Hallowicked! Wicked is one of the best in EPW and the first wrestler to enter the Excellence Championship Tournament! If Havoc can defeat him, he’ll propel himself to the top of EPW! The Boar of Moldova has become Excellence’s bruiser, and after the recently returned Kobald. However, The Prince of Goblins is cunning and has a spear of his own he wants to use to put down the Boar before flushing him down the demon’s toilet. Will Kobald’s speed help him outwit the Boar or will Boar’s size and strength put Kobald on the injured list permanently? “Freshly Squeezed” Orange Cassidy will return to EPW after a short absence to take on an old friend in Dan Champion! While I’m looking forward to his match, I’m not looking forward its conclusion, as this will be Champion’s last wrestling match. Dan is one of the best wrestlers and performers in the Excellence locker room. He will be deeply missed by me and everyone else in the EPW locker room and the office! In the main event, The Batiri (Obariyon and Kodama) will return to EPW to take on One Night Only (Marq Quen and Anthony Gangone) in a rematch from “20% Gratuity”! The Batiri took ONO to the limit and almost ended their undefeated streak! At “Kittens Mittens”, The Batiri will return to EPW and wrestle ONO again in the main event! Will ONO stay undefeated after Saturday or will the devilish demonic duo be victorious? In addition to these huge matches, I’ve tasked my Administrative Assistant Babs to work on a special project which we’ll reveal at the event! Plus, I may have some other surprises up my sleeves (or mittens) lined up for the show…trust me when I say you won’t want to miss “Kittens Mittens” this Saturday! Excellence was happy to be part of National Pro Wrestling Day ’16! Broadway represented EPW well in the Young Lions Cup and we presented a tag team match – Havoc and Danger versus Gangone and Sasha Jenkins! Purchase the event for only $9.99 right here! If you love EPW, we have a Facebook Page and Twitter, so be sure to like and follow us. We also have a YouTube Channel featuring footage from our last event, “20% Gratuity”, “Excellence Live”, 5 Minute Matches, and videos featuring the stars of EPW! Don’t be shy or buy into the myths that black cats are bad luck! Friend me on Facebook! Also, visit our website for more updates and missives from me, Edgar Excellence, the Head Cat of Excellence! See you this Saturday in Sellersville!